Autumn is around the corner, y'all! And that means that it's time to start sharing some of my favorite kind of palettes. You know the kind! They're the sort of palettes that are full of the warmth, texture and all kinds of Autumn goodness. Brown tones really are quite lovely. Wouldn't you agree? Especially the kind with reddish undertones like these. I'm so in love with this gorgeous bouquet. And what's not to love about that dainty little bow belt? Looking for a bridal accessory that's sure to wow? Why not try a sparkle halo like this one from our friends over at Sibo Designs? So lovely and ladylike! So what do you think? Oh, and is anyone else obsessing over the fact that Autumn is right around the corner? Or am I the only one? Seriously, guys. I really can't wait! 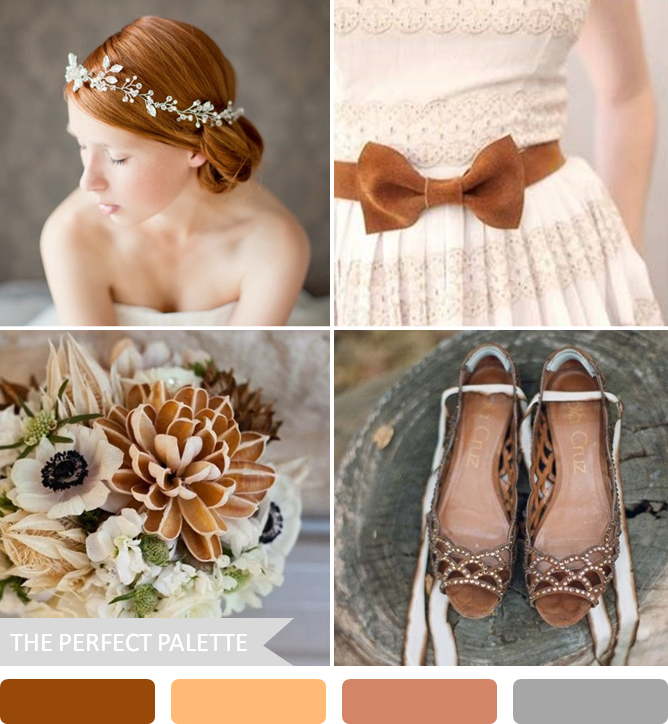 20 Comments " Little Autumn Bride | Shades of Brown "
I'm not sure if I'm ready for fall yet, but this palette has me warming up to the idea! So pretty - love that velvet bow! This is so gorgeous! Perfect colors for a fall wedding! L O V E this palette, and the change of season! This is such a perfect inspiration board. LOVE it! I love this palette - so rich and full of beauty! Where do I get those shoes?? I love it all! I look like the girl in the picture lol and love it all! But I don't know where to start to find those shoes. Help!! So pretty! Especially those heels. Love EVERYTHING about this palette! This is just amazing. Well done. So pretty- love that bow belt so much! Pretty things. Everything is beautiful. this is really romantic and vintage. Love it! That bouquet is awesome for a fall wedding! I have to say being a redhead in both skin and hair I'm drawn to this palette! I'm so ready for fall - gorgeous colors!